With a wide range of canoe, SUP and kayak gear and accessories , YakGear’s durable, versatile product line allows customers to embrace the water on their own terms. 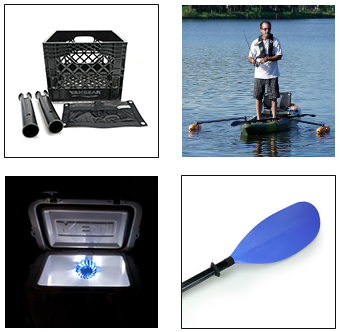 Our kayak accessories are made not just for people who consider paddlesports a hobby, but also make it a way of life. For more than ten years, YakGear has supplied quality equipment that elevates a good afternoon of fishing to something great – and new products are in development all the time.With YakGear, you can experience kayaking on your own terms. It’s the reason we offer a range of kayak gear and accessories customizable to all types of adventurers. All our products stand the test of time – they are developed, built, tested and manufactured to meet an angler’s needs. The quality of the materials used in our kayak gear and accessories hold up in all types of wet conditions, both fresh and saltwater, and we’re the only company to offer a three-year warranty for each product. For those who choose to live life on the water, YakGear is here. Your Yak. Your Rules. Interested in carrying YakGear products? Contact Us.